Heat oven to 350°F. Grease and flour round pan, 8x1 1/2 inches. Beat all ingredients except chocolate chips and pie filling in large bowl with electric mixer on low speed 30 seconds, scraping bowl occasionally. Beat on high speed 2 minutes. Stir in chocolate chips with spoon just until mixed. Pour into pan. Bake 37 to 40 minutes or until cake springs back when touched lightly in center. Cool 10 minutes; remove from pan to wire rack. Cool completely, about 1 hour. Top cake with pie filling. 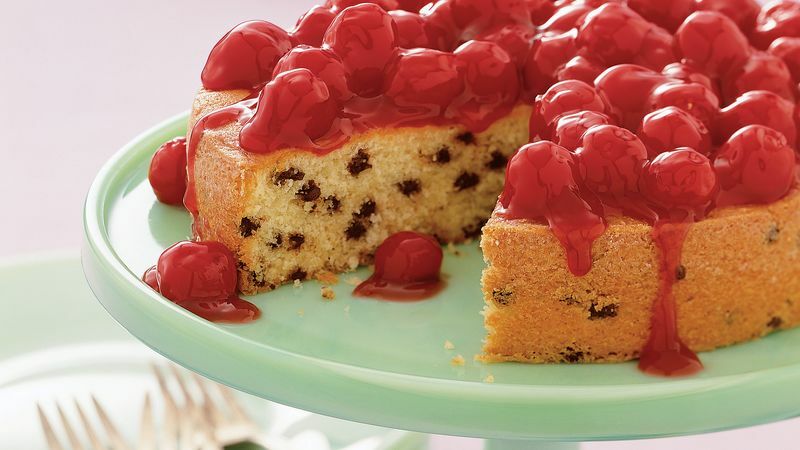 Surprise your valentine by drizzling this cherry-topped cake with melted chocolate chips. Because miniature chocolate chips distribute more evenly than the regular size, you can usually use fewer chips and still get a rich chocolate flavor.